By 1922, Luther College owned a museum curated by Dr. Knut Gjerset, who added to the collections by requesting artifacts from Luther alumni living around the world. In early 1924, Reverend R.O. Evans exchanged letters with Gjerset about getting objects for the museum's Indian Collection since Evans had frequent contact with a respected trapper fluent in the language of Ojibwa, the local tribe. On the trapper’s recommendation that an Ojibwa canoe would be “the very finest specimen” for the collection, Evans commissioned a birch-bark canoe for $25. Ojibwa canoe-builders took a period of four months to build one canoe, using materials found in their Great Lakes environment. Birch trees provided large swaths of water-repellant bark, spruce tree roots provided flexible and strong stitching material, and cedar lumber provided the strong skeleton of the canoe. After harvesting the wood materials, the builder soaked strips of cedar, curved them, and dried them into the proper curves, a process that took about three months. The actual building process took the last month and started with the following steps: creating the gunwales and thwarts from cedar, pounding a series of wooden stakes into the ground in the shape of the gunwales, and lacing together bark pieces inside the stakes. Next, the builder filled out the hull by inserting flat cedar strips lengthwise and the curved cedar ribs crosswise inside the bark. He then secured the canoe’s shape by lashing the gunwales and thwarts to the canoe’s hull. The last step was applying pitch, made from spruce gum, to waterproof the sewn seams. On July 4th, 1924, two Ojibwa women paddled Luther’s new canoe thirty miles north. After hiring a truck to haul the canoe to International Falls, Minnesota, Evans then had a freight box built for the canoe and shipped it via train to Luther College. The cost of the canoe plus shipping was $35. The canoe arrived in Decorah in late July 1924. In February 2011, I took my first tour of the space in the library basement used by the Luther College Anthropology Laboratory to store its collections. Among other interesting artifacts, I saw the two-person, birch-bark canoe owned by Luther College. Afterwards, I forgot had forgotten all about it until I spent the next summer guiding back-country canoe trips in northern Wisconsin and Minnesota. After one summer working there, I've continued working each summer as a guide, learning about the cultural interactions between French-Canadian Voyageurs and the local Ojibwa tribe. I guided with a reconstructed canoe known as a "Montréal" canoe. Voyageurs used Montéal canoes, which are more than twice as long as a typical two-person canoe, to travel the Great Lakes and larger rivers. They created these canoes by adjusting the template of an Ojibwa long-nose canoe. After guiding trips with a canoe reconstructed from French-Canadian Voyageur history, I returned wanting to learn more about Luther's canoe. This earthenware bowl is colored with commercial poster paint made by the Tesuque Pueblo. 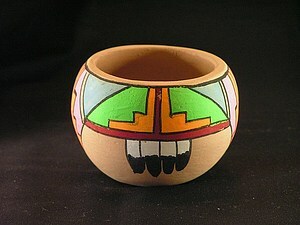 Traditional Puebloan pottery was used locally and techniques included the painting of design before firing. Although this bowl shows some traits of traditional Puebloan pottery, this one was made for tourists. The colors are brighter and were added after firing. In the late 1800s, the Pueblo people were having a hard time meeting their needs, so they started to sell their pottery and handy crafts. These sold well, so they began to make their pottery exclusively for the tourist market. 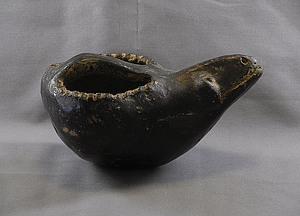 At the time many museums and government institutions went to the Pueblo people to collect cultural objects. 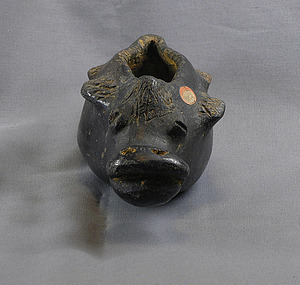 By that time, many traditional crafts were no longer available, so tourist objects like this are among museum collections. I chose this object for display because after a semester of looking at rock and pottery for my senior paper, I wanted to see some color. This bowl is very bright and colorful compared to other bowls from my study. In addition, the Puebloan culture has an interesting history that I would like to know more about. As a child my grandpa would watch westerns all the time, thus I was drawn into the culture of the Native Americans. This ceramic bowl lacks an artist signature, but is typical of the 'cameo style' of carved black pottery made by the potters of Santa Clara Pueblo. This style was established in the 1930s by potters such as Rosalie Aguilar and Rose Gonzales. 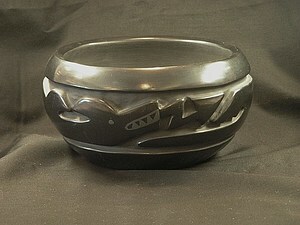 This pot was purchased at Sewell's Indian Arts store in Scottsdale, Arizona some time before 1984, likely in the 1970s or 1980s according to the current owner. The carved design depicts Avanyu, a Tewa deity and guardian of water. The Avanyu live in the waters of the Rio Grande River in New Mexico. This serpent has associations with lightening, as depicted with the zig-zag motifs in the iconography. Avanyu imagery also appears across the American Southwest as rock art, carved on canyon walls and in caves above the river indicating the important associations with water ways in the arid desert of New Mexico. This stunning bowl reminds me of my fifteen years of living in the Southwest prior to my arrival in Iowa. My first southwestern archaeological project was near Truth or Consequences, New Mexico as a graduate student at Arizona State University in the 1990s. My current research in Mexico incorporates iconographic interpretations of pottery designs, including the mythical Quetzalcoatl, or "feathered serpent" which may be a distant relation to the deity depicted here. 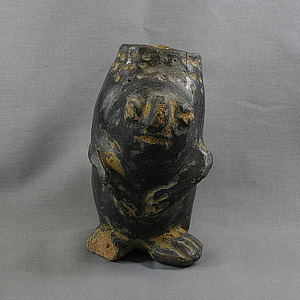 This collection of eight terracotta black ware effigies is aquatic animal-themed, displaying similar bulbous shapes, each with unusual yellow-orange soil deposits on the surface. These vessels have been in our collections for over forty years and their identity lost... until now. Over several months early in 2014, we extensively researched the origin of these unusual pots. We suspected that the pieces were Central or South American and possibly Pre-Columbian antiquities. Thanks to the Curator of Collections at the Logan Museum of Anthropology in Beloit, Wisconsin, we learned that they were from Colombia and were part of a famous collection of forgeries now called “Alzates,” named after the family who manufactured them. During the late 19th century, anthropology was emerging as an academic discipline, and the collection of artifacts from lost or ancient cultures was popularized by wealthy collectors. Don Julian Alzate, a taxidermist and known tomb raider from Medellin, Colombia, began making these ceramics along with his two sons. Quickly their “Alzates” were distributed as genuine pre-Columbian artifacts due to the support of the well-known collector Don Leocadio, a family friend. Don Leocadio bought thousands of them to fill his own museum, believing them to be authentic antiquities. The Alzate family went to great lengths to provide evidence of their antiquity, taking collectors on digs to “discover” the ceramics in grave sites. The Alzate family successfully deceived the academic world until 1914, when Eduard Seler decried the Alzates as frauds at the First International Ethnographic Congress. It was not until 1920 that these objects were publicly denounced as forgeries in a Colombian newspaper. I chose this collection of artifacts because they were very mysterious and appeared to be really old. I was hoping to prove that they were in some way historically significant to make up for their unpleasant appearance. As it turns out, these objects have an interesting historical relevance and now they can be used for examples of antiquities forgeries and also as folk art in their own right.